Ryan Rose and Nick Fishman analyze the 2-0 loss. I make this comment with respect, but it has to be done and it seems nobody else seems to do it —so once again, someone has to address the elephant…..in the room. ….I know there are some media members who do this for free. I also know there are some media members who earn a living or a part of a living covering this team. Gotta tell ya… not following up with the manager and pressing him on CJ is an error of journalism and I just do not understand it. I’ve lived in this town my whole life, and short of the withering lines of questioning that comes from this website, very little is done on a comparable scale with Union when it comes to A. asking hard questions. and more importantly B. following up once a question has been asked and the manager gives his standard riposte. 1. 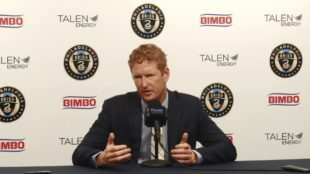 ……..Is CJ Sapong the starting striker in 2 weeks and if so how are you able to continue sending the player out there when his back up is clearly more suited to a single striker formation and has produced more goals than CJ has produced shots. 2. ……it seems CJ’s struggles with the timing of his runs and seldom drags defenders out of position. If one watches the game very closely he seldom attempts to stretch the field. Come to think of it Corey Burke accomplished more off ball movement in the first 7 minutes of his cameo than CJ did in the whole game. Can you comment on what it is that continues to give you faith a player who is not a pure striker is going to begin producing like a pure striker when a player making $500,000 sits on the bench and the current back up seems to fit so much better with the style of play? This is how the dirty work is done. Figure on getting terse responses. Its part of the territory. Figure on the manager coming up with a whole new manner of parrying the advances….that doesn’t mean the advances should not be coming though.